- HDD: automatically detects fixed HDDs. Shows the letter, the name & free space. Mouse over for more information (total/free/used space). - Player: shows the name of the artist, the title of the song, title of the album, cover album.... It indicates the position of the title and the total length. Buttons: play/pause, stop, previous & next. Left click on the bar to change song position. Volume options (left click on the percentage increase sound, right click decrease). - System: CPU usage, GPU (requires Windows 10 fall Creators Update or later), RAM & SWAP (mouse over for more information for RAM & SWAP). Battery level, number of open processes & recyclebin. Wallpaper "Atlantis nebula 3". Original author Starkiteckt. 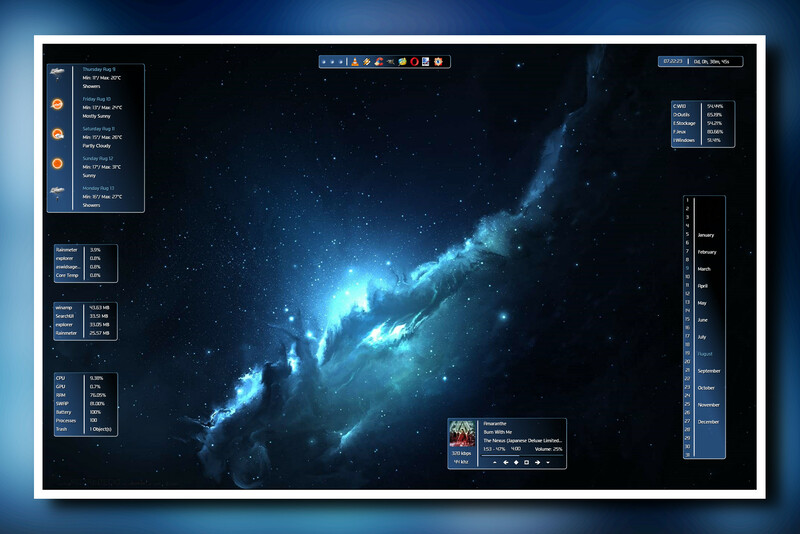 As always, you own Rainmeter skinning. Well done. Thanks a lot, I appreciate . Thanks a lot . It's true that I like it too. A great success .